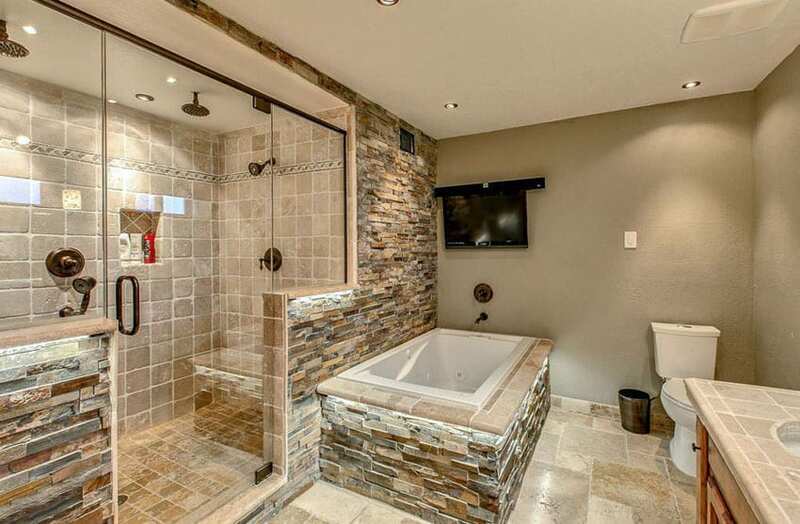 This gallery showcases travertine shower ideas in luxury bathrooms with expansive layouts, high-end decor and finishes. With tones of tan, white, cream, browns and reds, travertine tile comes in a wide variety of styles. The natural limestone looks elegant and can definitely provide a feeling of total luxury for your bathroom space. 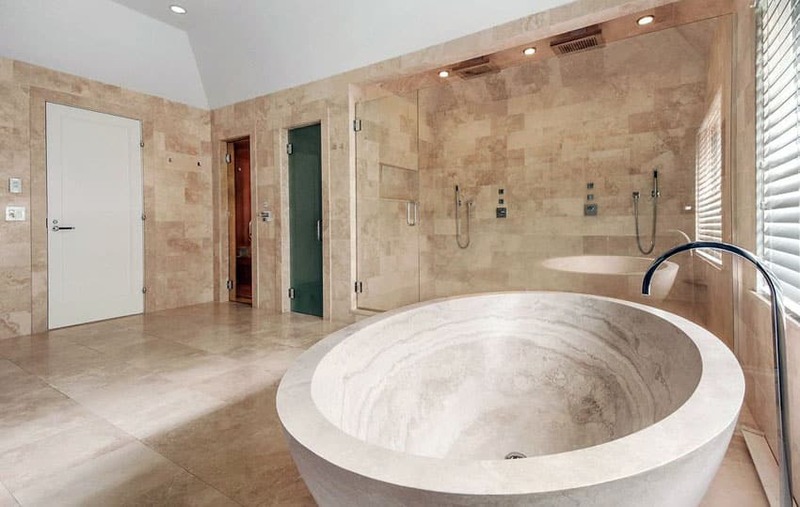 Below you’ll find bathroom designs with travertine to create your own perfect spa like retreat. 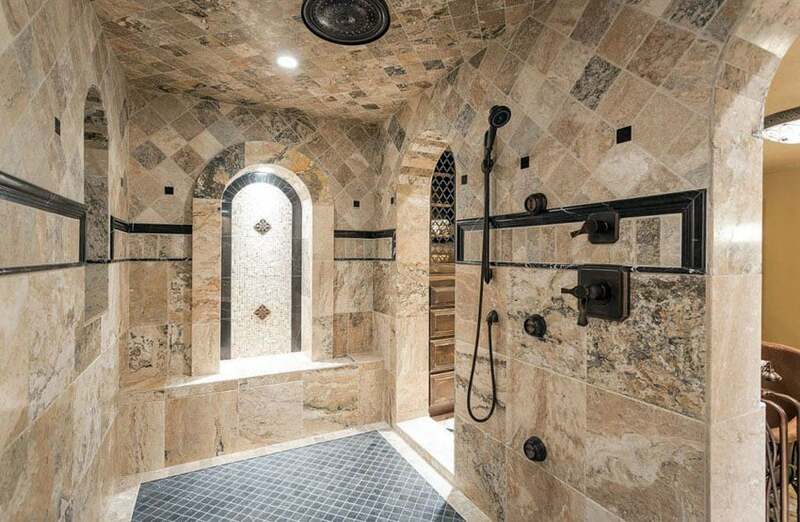 In the picture above this luxury shower chooses a wider grained stone tile for its flooring, which gives focus to the rich travertine subway tile lining the shower walls. A smaller basket weave variety is used for the shower floor, giving it a more non-slip quality. The rest of this luxurious master bathroom features a light cream color for its raised panel drawers and a smooth polished travertine slab for its countertops. The large mirror on the lavatory is framed by a Classic style built-up architrave in clean white. One of the best finishes for bathrooms is stone, not only because of the beautiful grains and textures stone can come in, but also becomes it is a good non-slip surface when fired, matte or bush-hammered. One of the most easily recognizable natural stone surfaces is travertine which is constructed from natural limestone. Coming in a variety of colors from white, beige, gold, brown, red, grey and even to an almost bluish tone, travertine is also prized for the patina it gains as it ages. This gives travertine the special trait of becoming better as it ages, as opposed to other natural stone variants wearing thin or having its natural color fade through time. Depending on location, travertine can be a cheaper alternative to marble or granite tiles while maintaining the same elegant shade and grain. In addition, its natural porous quality gives travertine a lot of natural holes on its surface. This may seem like a disadvantage in other rocks as dirt can get inside these holes, but for travertine, this look just adds to the dramatic quality travertine provides. Because of this naturally dramatic look, travertine may be considered a more ecologically conscious choice. Travertine does not have to undergo many manufacturing or re-working procedures before becoming a finished product. Before having travertine installed for your own bathroom, there are some important things to take note of for maintaining the look and providing proper care for your flooring. First, although the porosity of travertine is generally welcomed, it would be wise to use a special sealant or polish product on the tile before installation. These pores are large and might even go all the way through, so defending entrances and exits for water and other substances should be considered as prolonged exposure can create cracks or cause tiles to pop out of their layouts due to the tiles expanding because of water. Another important thing to take note of is that the porosity of travertine and its reactive mineral composition may sometimes cause spills to stain on the stone. For example, acidic juices such as orange or lemon could react with the travertine mineral structure and cause a permanent stain. Needless to say, some common household cleaning products may be incompatible with travertine floor tiles. For example, similarly acidic cleaning agents such as vinegar or salt must not be used on travertine tiles. Care must be taken in choosing a cleaning product that is less acidic and will not react with the travertine. All in all, travertine is still a great finish to use in any house, provided the homeowner is responsible enough to take care of this beautiful natural stone. It is still a great conversation starter with its variety of colors and elegantly carved lines. The variety of colors, tile shapes and sizes provides many different travertine shower ideas to create a beautiful bathroom design. 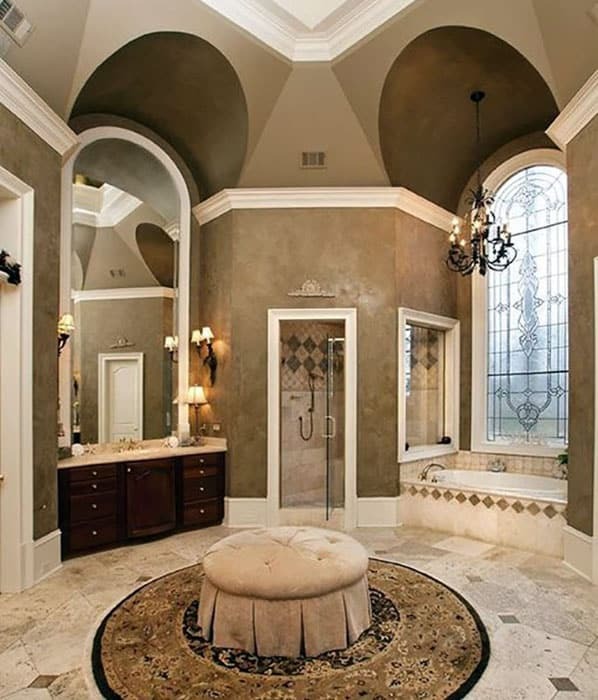 This Mediterranean style bathroom features a pair of arched entry ways leading out to the main bathroom. Two smaller alcoves exist, a high window and an illuminated recess in white stone tile. 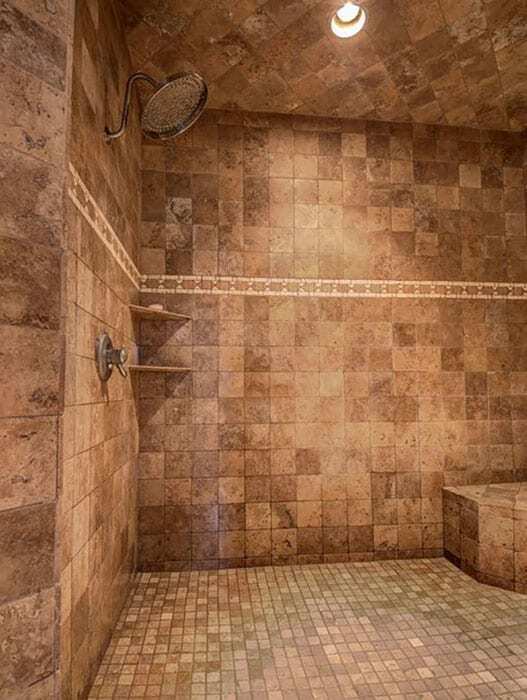 The rest of the shower features travertine wall tiles, a good background to the bronzed finish of the taps, telephone shower, and rain shower. Bordered by travertine tiles, the main shower floor features a black stone mosaic tile as a contrast to the beige travertine and as a great non-slip option. 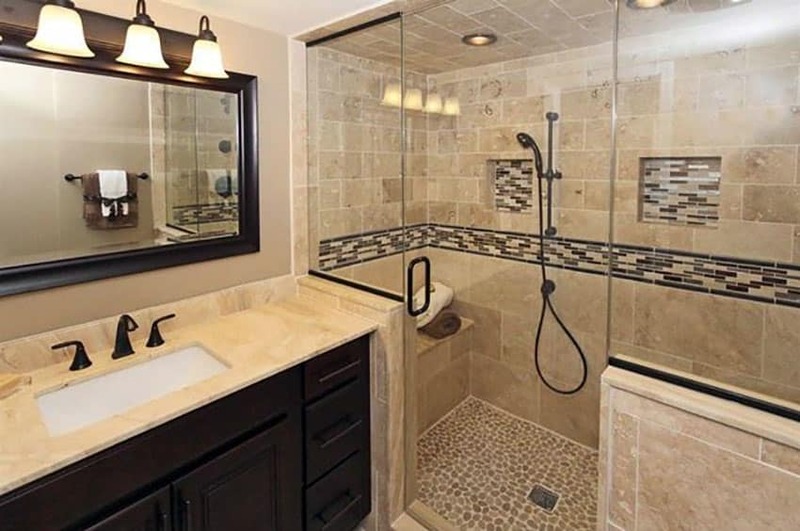 This craftsman style bathroom boasts a beautiful oversized glass shower with a bronze frame, rainfall shower-head, patterned travertine tile floor and wall inlay. The two separate bathroom vanities feature granite countertops and rich wood cabinetry. An enclosed tub sits in the corner and offers outdoor views. This luxurious but traditional style mansion bathroom features a polished brown granite finish for its floor tiles that contrasts well with the clean cream paint used for the cabinets, trims and raised paneling for the tub area. The tub is set in a hexagonal outcrop, decorated with sheer curtains and a granite top. The glass enclosed shower area features a rough travertine tile in smaller cuts, with color varying from white to beige to brown. 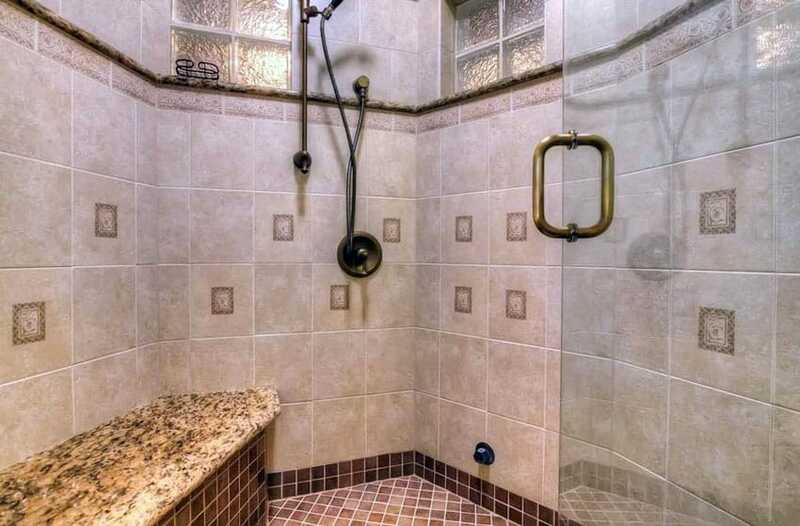 This luxurious bathroom features a double capacity shower with rich gold taps, shower head and water jets. The expensive feel of the taps is given a more natural look using the white and brown stained travertine tiles for the walls. The floor, shower bench and wall accent are in a micro mosaic tile of the same travertine tile, bordered by brown granite trim. 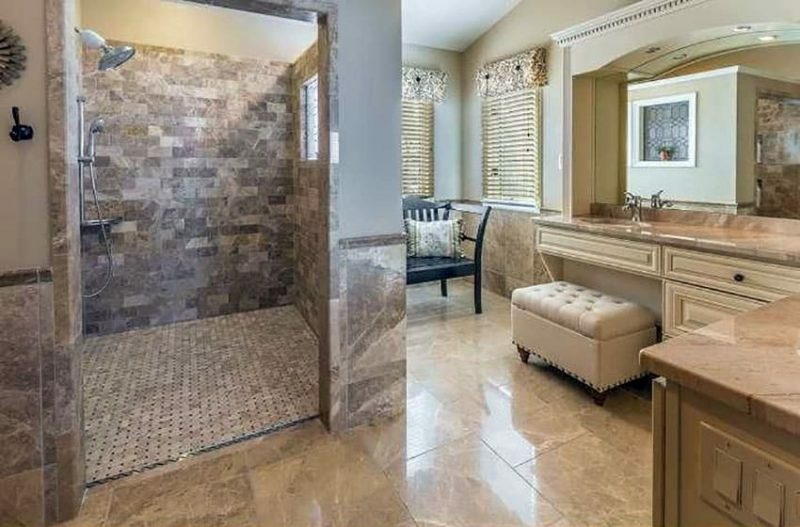 This large master bathroom features a light beige travertine tile all around, with a bigger square cut for the floors and a small rectangular cut for the walls. The ceiling, wood door and window blinds are all in a clean white, which brings out the gentle grain of the stone patterned resin tub. The highlight of this bathroom is the glass enclosed shower area with chrome finished taps, and a pair of telephone showers and rain showers – perfect to use for two. This luxurious master bathroom features a mirrored white stone countertop with peach-colored raised panel undercounter cabinets and drawers. Atop these, a wall-long mirror occupies the space. The massive room features a central enclosed tub or white resin matched with Classic style oiled bronze taps. 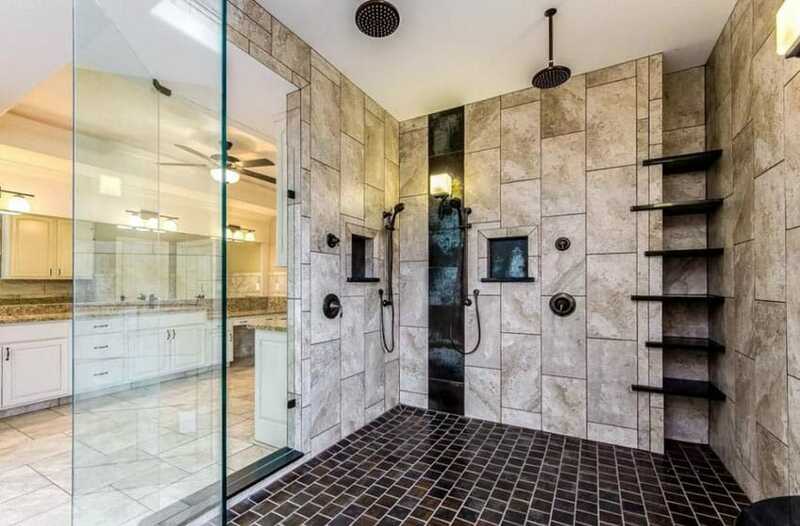 To the back, clear tempered glass encloses a shower area with a pair of matching showerheads and wall-mounted taps, also in the same oiled bronze finish. Travertine was the main stone tile used for the back wall of the shower, as well as the base of the bath tub enclosure. This modern bathroom features a few traditional elements such as the door and window trims, contrasting with the wild-grained beauty provided by the travertine tiles lining the bathtub and shower area walls. As a more modern element, the bath tub taps, rain shower and telephone shower are all in a chrome finish. On the outside, the vanity counter features a plain glossy white stone countertop with dark wood laminate cabinets and casework. This Southern style bathroom features a brown travertine tile on the walls and ceiling of its shower area, mixed with a black brown and white mosaic tile on its wainscoting and coved shelves. A simplistic river rock in cement was used for the flooring, accented by the smooth profiles of the matte black telephone shower. On the outside, matte black was also used for the lavatory taps, contrasting with the classic style vanity lights mounted on top of the mirror. This craftsman style bathroom starts with the intricately carved warm wood drawers and windows at the vanity, topped by a travertine countertop. Leading into the curved shower area, a large Persian carpet is bordered with an eclectic arrangement: a pink armchair, red throw pillow and large potted plant. The curved shower features travertine tile on its floor, walls and shower bench. A complicated set of taps, shower and jets are mounted onto the wall, as a rain shower is mounted on the ceiling. 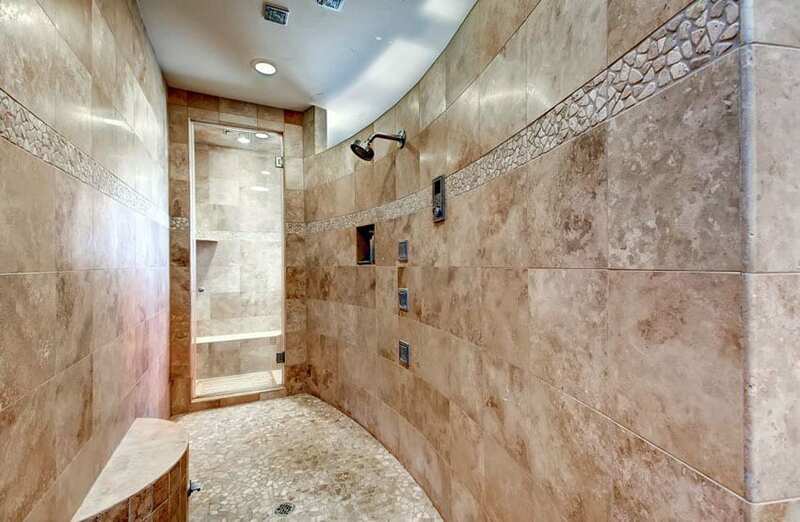 This large shower room features a curved wall dressed in matte brown travertine tiles. The opposite wall, featuring a low shower bench, is also done in brown travertine while a band of split face river stones runs along the length of both walls. The river stone finish is also used for the flooring, and the coarse natural finish goes well with the polished vintage finish used for the shower and taps mounted onto the wall. 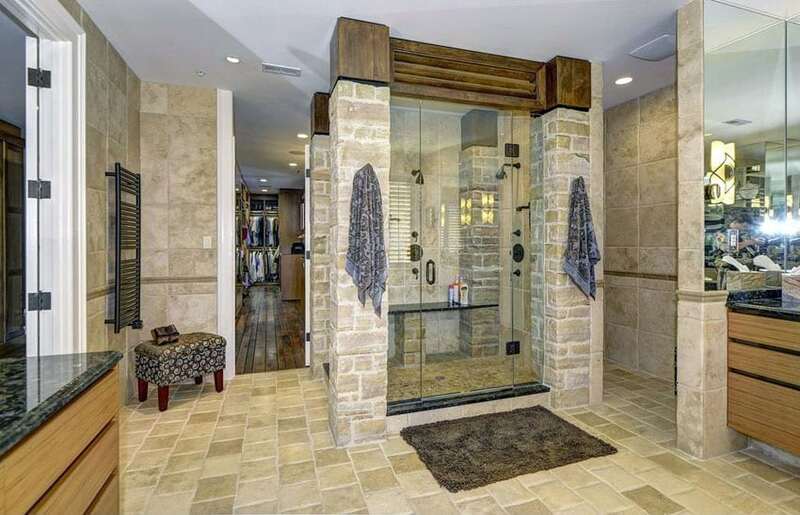 At the end of the room, a glass door serves as the entrance into this cave-like shower. This large shower features rough travertine tiles on its walls, disturbed only by two fine lines of beige mosaic tile running along its width. An arched alcove is carved into the corner, with its interior done in the same beige mosaic tile. On either side of this corner is a pair of wall-mounted showers with taps done in a vintage oiled bronze finish. This small shower’s interior with travertine tiled walls is lit by a small high window. 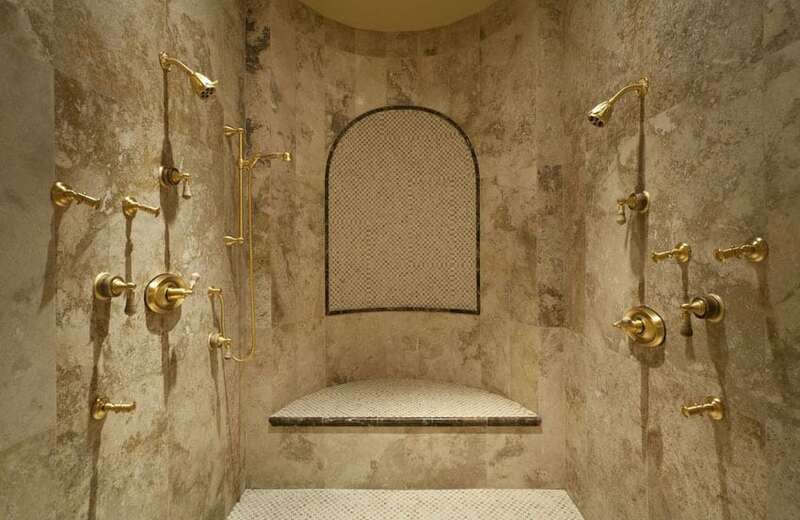 A small bench in a lighter sandstone colored tile is built on the corner, while vintage oiled bronze finish is used for the shower, rain shower, towel rack and wall hook. This very rustic looking shower room features a square cut rough travertine tile on its walls and ceiling, as well as the bench built-up to the side of the shower. The floor is in a lighter shade mosaic tile that matches the patterned tile running along the width of the shower walls. On the other corner, triangular wooden shelves are installed, and the large rounded feature shower head becomes the central element of this rustic style bathroom. This large shower area comes from a traditional style master bathroom with a lengthy vanity countertop with three sets of wall mounted vanity lights illuminating the emperador stone countertop. The large shower area is bordered by a glass wall and white travertine stone tiles on its walls, separated from each other by a dark colored grout—creating a visually stunning linear effect. The floors, on the other hand, feature black subway tiles with light colored grout, creating an almost monochrome effect when contrasted with the walls and the matte black taps, telephone showers and rainshowers mounted on the white ceiling. This large luxury shower features travertine tiles on its angular walls, with some tiles featuring a square pattern. The floor is in a brown stone mosaic tile, leading up to the corner stone bench with a speckled stone top. Oiled bronze telephone shower, taps and door handle all give this shower room a vintage feel, further emphasized by the glass blocks at the very top of the wall to light up the entire space. 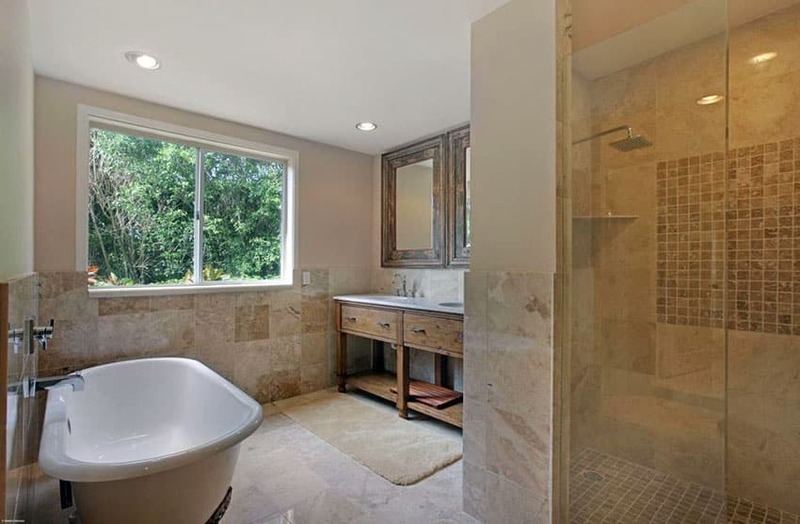 This luxury master bathroom uses larger travertine tile cuts in its main bathroom area, terminating at the middle where the walls are painted a clean off-white color. Inside the shower, a darker tone is used for the mosaic tile square insert and on the floor, amidst the same large cut light travertine tile. The square wall-mounted showerhead and modern style bath tub suggest a more Contemporary vibe while the vanity counter suggests something more rustic with a pair of sinks installed onto a pair of wooden drawer and shelf sets. This master bathroom has a very luxurious feel thanks to the vaulted high ceilings, complemented by arches over the bathtub with tall arched frosted window and the vanity counter with equally tall arched glass mirror. A lovely bathroom chandelier hung over the tub gives this room an elegant appeal. On the center, a round patterned rug is topped with a beige button-upholstered Ottoman. All around, a light shade of travertine tile is used for the floors and built-up wall, with a similar stone finish used for the dark wood cabinetry’s countertop. To complement the natural stone finish, the rest of the bathroom is painted a grey textured stucco with clean white trims. This Mediterranean style bathroom features some dark heavy-grained wood for its doors, as well as its recessed panel undercounter drawers. The countertop is a grainy brown granite, which is also used for the platform to the sunken antique metal tub to the side with oiled bronze taps. The bathtub area is lined with a diagonally laid out rough travertine tile. 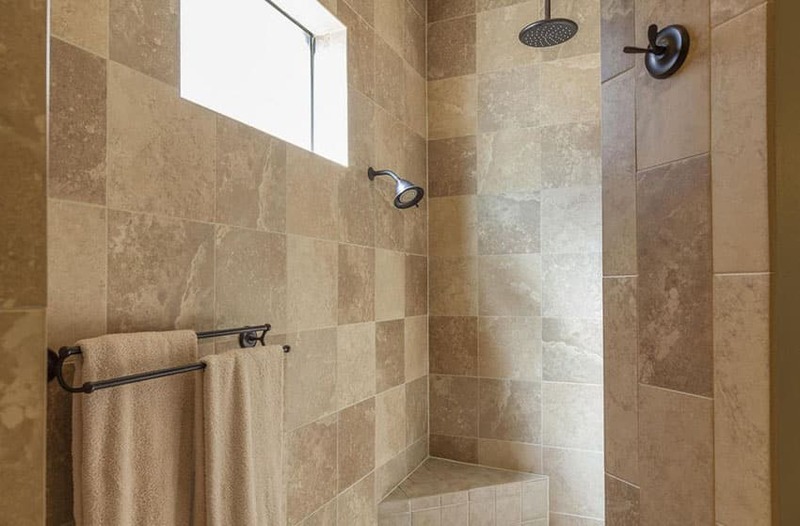 A larger cut is used for the glass-enclosed shower area and the walls are painted a dark brown-grey to go with the travertine’s natural color. For a more Mediterranean feel, a wooden blade ceiling fan and hanging lampshade chandelier were added to the center and over the bathtub. This cottage style bathroom features a small square enclosure at the center to serve as its shower area. Enclosed with glass, the interiors feature black metal taps, shower, door handle and hinges. On the outside, split face travertine stone is used to build up the pillars with heavy wood beams for its top portion. The same rough split face is used for the floors, while a smoother, larger cut is used for the walls. Travertine shower ideas that combine the stone with accents of wood can create a warmer feel and emphasize a craftsman touch. 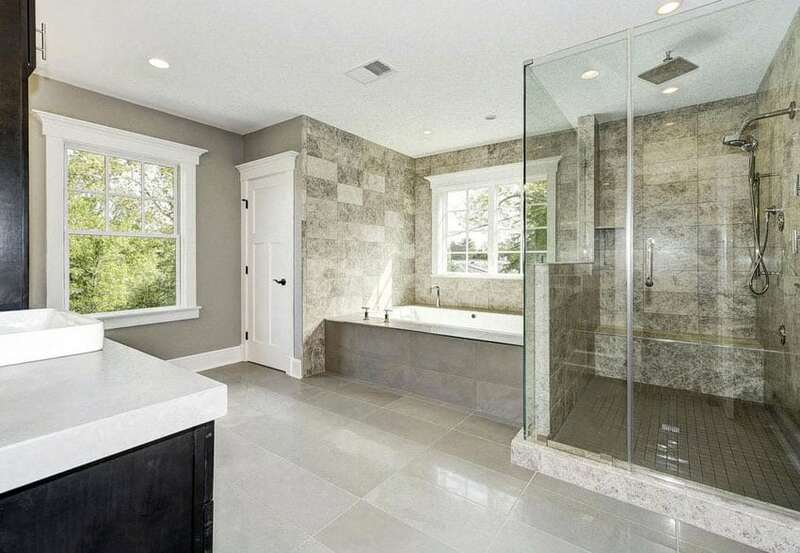 This contemporary style bathroom starts with a grey textured stucco all around its walls with a textured travertine in varied sizes for its floors. 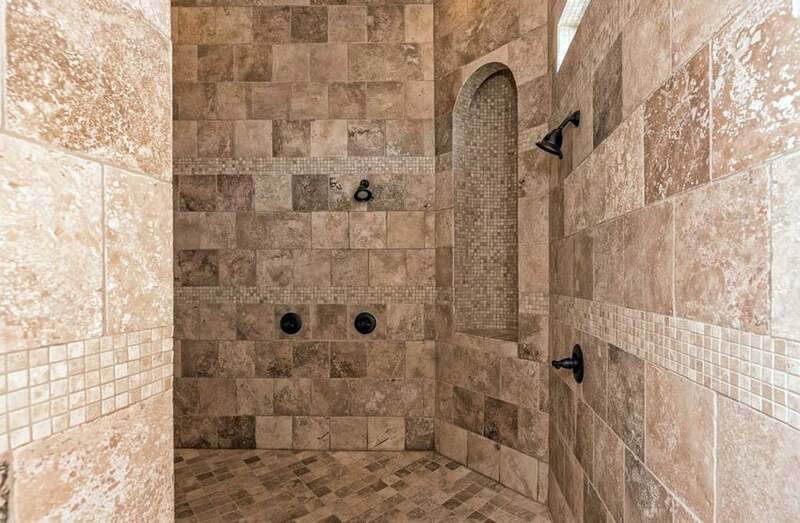 On the inside of the glass shower enclosure, smaller cuts of the travertine tile are used on the walls which feature oiled bronze showerhead, taps and a pair of matching rainfall shower heads. In a contrast to the smooth color and grain of the travertine, slate in blue, brown and orange and cut into thin rectangular pieces were installed onto the outer wall as well as the built-up for the white ceramic bath tub. Visit this page for more luxury bathtubs you’ll love.